Adiant officially announced Tuesday the acquisition of Solve Media's advertising CAPTCHA business unit and its TYPE-IN ad platform. Exact terms of the all-cash deal were not disclosed. Ari Jacoby, co-founder and CEO of data company Circulate, and former CEO of Solve Media, told Search Marketing Daily he is "excited" about the decision and that the "all-cash deal is good news for our shareholders and allows us to triple-down on serving a valuable market need." Adiant marketing manager Sarah Meegan says Solve Media, founded in 2009, will remain a separate business unit, but will roll up under the Adiant suite of products. The deal includes patents, technology, client list, sales team, development team and design team. All parts of the company related to the Solve Media TYPE-IN CAPTCHA business, such as names and trademarks, are also included with the agreement. Adiant, based in Somerville, New Jersey, also gains relationships with brands such as Merck, British Airways, Fedex, P&G, Unilever and New York Life also come with the deal. The company has a long list of white papers from brands willing to share their experience. Walgreens, for example, ran a type-in CAPTCHA with the goal of better understanding the brand’s positioning in the minds of consumers by asking consumers to "describe this brand with your own word(s)." Not only did Walgreens discover how consumers feel about it, but it built a list of keywords to use in future campaigns that helped it connect with potential and existing customers. With the acquisition of Solve Media's advertising business, Adiant will expand into Philadelphia as well as add to its existing team in New York City. Growing its business, Solve Media took $16 million in venture capital funding from companies including AOL Ventures, First Round Capital, and Bullpen Capital. It built out what it called a native advertising platform in the form of a CAPTCHA in a fight against bot traffic. 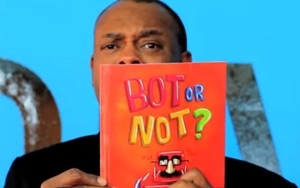 To get the word out, the company created a video in 2013 called "Bot or Not?" read by Michael Winslow. It told the story of online bots in the form of a nursery rhyme for children. 4 comments about "Adiant Captchas Human Authentication Tech, Wants To Thwart Bot Traffic". Zany Danger from Marketing, November 10, 2015 at 3:31 p.m.
Firesales are good news for shareholders? Who knew! John Coctostan from Brightroll, November 12, 2015 at 11:38 a.m.
Sam Schwarz from GOAT analytics, April 8, 2016 at 12:56 p.m.
Great market opportunity. I really like was Circulate, Adobe and Twine are doing in this space. Sam Schwarz from GOAT analytics, December 1, 2016 at 4:43 a.m.
Just saw that Circulate, the company that Solvemedia morphed into, got bought buy Acxiom: http://www.mediapost.com/publications/article/289406/liveramp-finalizes-140-million-deal-to-purchase-a.html Very impressive pivot--looks like the VC's and management did well after all.